STUNNING FINE LARGE VICTORIAN 15ct GOLD MOUNTED CARVED ANGEL SKIN CORAL CAMEO BROOCH. 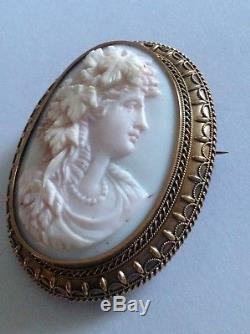 A FINE QUALITY VICTORIAN CARVED ANGEL SKIN CORAL CAMEO BROOCH - CIRCA 1880. THE LARGE OVAL BROOCH SET WITH A CHARMING FINE CARVING OF A MAIDEN WITH GRAPE VINES IN HER HAIR. MOUNTED IN FINE 15ct GOLD ETRUSCAN SETTING. WITH FINE APPLIED BEAD & ROPE DECORATED BORDERS. THE BROOCH RETAINS ITS ORIGINAL GLAZED PANEL TO ITS REVERSE. 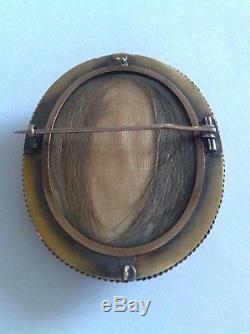 DIMENSIONS OF BROOCH - 5.5 cms x 4.5 cms. 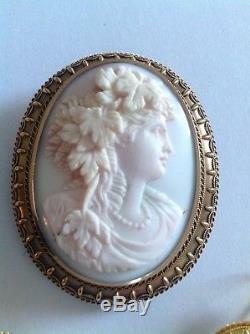 A BEAUTIFUL ANTIQUE CAMEO IN FINE ORIGINAL CONDITION. PLEASE LOOK AT OUR OTHER ITEMS OF FINE ANTIQUE JEWELLERY. The item "Antique Victorian 15ct Gold Carved Angel Skin Coral Cameo Brooch" is in sale since Wednesday, November 28, 2018.